Posted by Jon in equine, Pony, The Others on Friday 21/07/2017 18:00 UTC. After working hard with these individuals, teaching them the basics of pony life such as putting a halter on, leading and picking up feet. We have now decided that they have graduated and to let them find new life long homes. If you think you can offer one of our ponies a life long home then please contact us using the details below. We are not open to the general public and an appointment must be made to get a viewing. Please come dressed for the weather with suitable footwear for the fields. 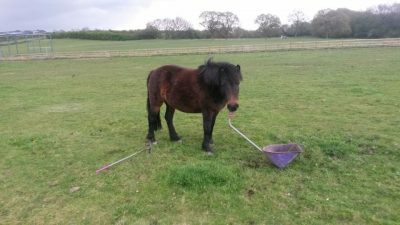 A donation of £60 per ponies is required to help the charity cover the costs of keeping. You will be entering a loan agreement whch will be discussed in your appointment. Photographic evidence of your set up is required and a home check will be carried out. Every year hundreds of wild Dartmoor ponies are rounded up off the moors and sold on – at least 80% are sold on to become pet food. Luckily in 2011, we were able to save young Teddy from such a fate. 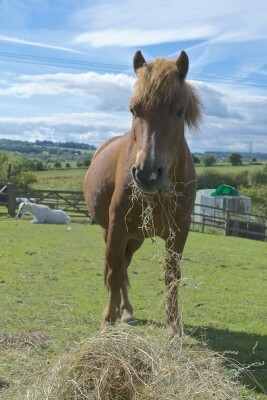 Teddy is an 5 year old, bay, 11.2hh dartmoor mare and lives up to her name! She sure loves attention and to be fussed. Teddy is great to catch and is fine with the farrier ( bare foot) and dentist. She is alright to load and is an overall little sweetie. She stays very close to her friend, Blue. Teddy has a passport and is up to date with her vaccinations and dental. She is at the perfect age to be backed and would make a brilliant little riding pony for someone! Juno was previously rounded up off the moors of Dartmoor. Brought by her previous owner, she was used as a breeder mare and organic mower in a honey farm. Due to reasons, she was destined for the slaughter house but thankfully her owner had a change of heart and brought her to us in Summer 2015. 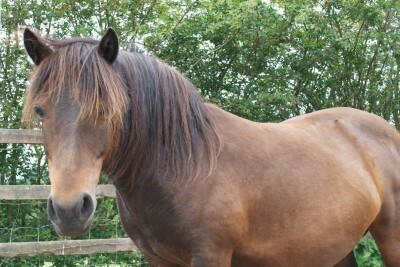 Juno is a wonderful 13hh dartmoor mare who very quickly settled down here at the centre. We are unsyre of the age but we believe her to be 8 years plus.She loves interaction and can easily be the centre of attention. Previously backed in the past, this girl is perfect to handle, okay with the farrier, vet and dentist - she just needs a little encouragement (food) when it comes to loading. Juno is waiting for her passport, up to date with her dental and is up to date with her vaccinations. She would make a great project for someone to get back into shape & reintroduce her back into ridden work. Billy didn't have a good start in life. Rescued from a life of abuse with his friend Smartie. Billy arrived at the centre in 2011. After some time he started to gain trust in people again and now you would never know it! 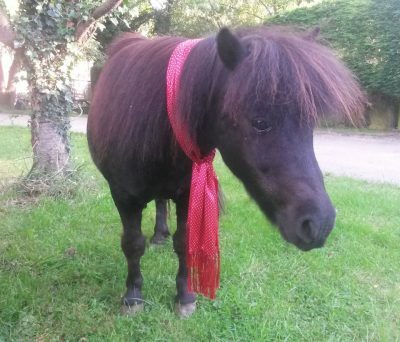 Billy is a 11 year old, 9hh gelding miniature sheltand and is such a cutie! He very good all round, to catch, lead, do dental and have his feet trimmed. He likes to be pampered and be the centre of attention. Billy is a bit of a ladies man and adores his mares! Billy does suffer with a life long condition called "sweet itch" in the summer - which will need to be controlled. For more information on the condition please check out this leaflet or this website. We are also happy to give advise. Billy is up to date with his vaccinations, dental and feet. He comes with his passport. Billy would be suitiable as a companion pony for either another horse or person! Smartie didn't have a good start in life. Rescued from a life of abuse with his friend Billy. 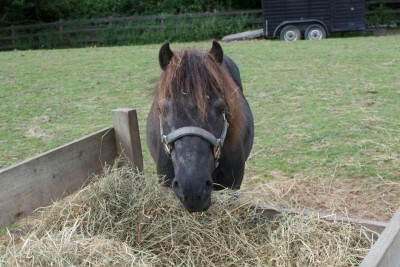 Smartie arrived at the centre in 2011. Since he has known abuse in his past, sadly he has shown fear to humans, taking a lot of time to get to trust indivduals. Smartie is a 20 year old, 9hh gelding sheltand. As an old boy, Smartie prefers to keep to himself. He takes a while to warm up to you and trust you. But when this does happen he is good to lead. Smartie is in good health. Smartie is up to date with his vaccinations, dental and feet. He comes with his passport. Smartie would be suitiable as a companion pony for another horse. He would prefer somewhere nice and quiet to retire to. Celeste was previously rounded up off the moors of Dartmoor. Brought by her previous owner, she was used as a breeder mare and organic mower in a honey farm. Due to reasons, she was destined for the slaughter house but thankfully her owner had a change of heart and brought her to us in Summer 2015. 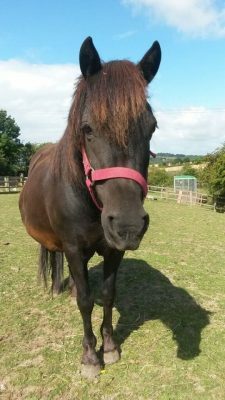 Celeste is a 11 - 12hh mare who is 1o years old. Her previous owner had labeled her to be be " as mean as a hornet" but she is nothing like that! Celeste is a very intelligent girl who excelled at clicker training. She is a curious pony, always wanting to know what you are up to ! She is good lead, catch and is used to being stabled. She is fairly good with the dentist and farrier. Celeste is full of character, she even has a sense of humor - often smiling with her upper lip when the treats are brought out or she knows she has done something good! Celeste is in good health. Celeste has started her vaccinations, and is up to date with her dental and feet. She comes with her passport. Celeste needs someone to further her training and to be backed. She would make a fantastic companion! View more posts in equine, Pony, The Others or browse all posts.You can follow this story via its RSS 2.0 feed.